Ever wish you could go back in time and be recruited for a classic NASA moon mission? You’re not alone. Live the experience with a Raygun Gothic Rocketship official Space Cadet Recruitment pack and a paper model of the actual rocket (value of both: $100). Add in a collectible SCHWA kit, complete with alien detection unit, still in packaging (value: $25). But wait, that’s not all! You’ll also get these Ginsu knives… OK not really… but you will be the proud recipient of Plazm #30 ($10), PDF preview of the magazine ($5), your name listed on our new upcoming website at plazm.org and in the magazine, plus an invitation to a VIP event (priceless). All yours for a mere $105 donation to our Kickstarter fundraising campaign. Tell yr friends and “friends” alike about our effort to get the next issue printed: http://kck.st/iNrLDS is the URL. 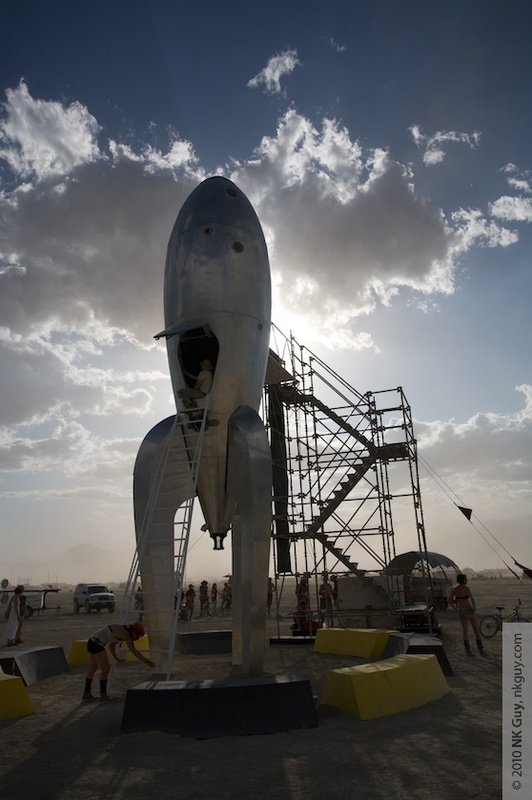 Above: NK Guy photo of the actual Raygun Gothic Rocket installed in the desert; it is now a large-scale sculptural installation on San Francisco’s Embarcadero waterfront. This entry was posted in aliens, bananafish, kickstarter, Love, rocketship, space. Bookmark the permalink.